Ethernet Cable Clip Repair by kohlmaker is licensed under the Creative Commons - Attribution license. These are replacement clips to fix broken ethernet cable clips. 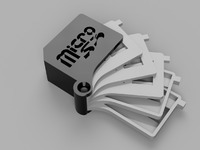 The clips attach to the Ethernet cable and replace the broken clip so that the cable stays locked into an Ethernet port. EDIT 2 - I recently posted some newer models that reflect the exact dimension per the Ethernet spec... that said I am not sure they work better or worse than the original design. I printed a few and tested them and they seem to work the same as the original design. Thanks to everyone who has downloaded these and posted comments! Enjoy! Takes approx. 8 minutes to print on a PRUSA Original I3 MK2. Make sure you print it with 100% infill to ensure its strong enough to handle the bending/flexing. 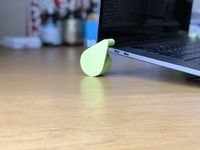 Does not require any Support/Raft and I would not print any bed adhesion (brim/raft) because it can impact the ability of the clip to fit into the port. I have several Ethernet cables with broken clips and I was sick of them falling out of my router. While there are a few alternative DIY ways to address this issue, I wanted to tackle a simple project that would help me learn basic design within Autodesk's 123D Design software. I "Remixed" the STL from Jaegermeiste "Ethernet Comb" and modified it to make a single comb with a locking clip. My design skills are primitive, but the result works... 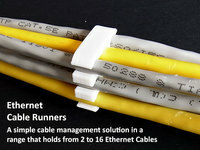 I have made 2 lengths to work with different versions of Ethernet cables (See the pics). If you are having trouble getting these to lock into the Port, just make sure bendable portion of the broken clip on your Ethernet Cable is completely removed. Feel free to modify as needed! Hope you find these useful! Say thanks by giving kohlmaker a tip and help them continue to share amazing Things with the Thingiverse community. We're sure kohlmaker would love a Tip, but unfortunately they have not setup their accounts to receive them yet.